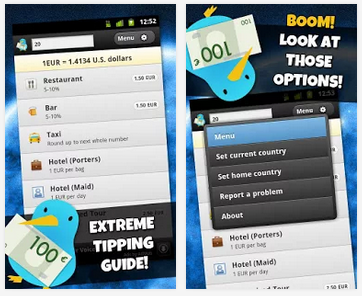 Tipping Bird – Travel App of the Month March 2014! What if one simple app could save you all of the embarrassment in the world? Well – good news, it can! Okay, it might not stop you tripping over in front of you partner’s parents, but it will at least advise you on how to politely tip the service at different locations around the globe. Meet Tipping Bird – your restaurant companion from here on in. So What Does Tipping Bird Do? This crafty accompaniment to your app collection handily helps you add a gratuity of an acceptable amount depending on what country you’re dining in. We know what you’re thinking – isn’t a 10% tip pretty customary? Nope! In the USA the average tip is around 19%, in the Dominican Republic you’ll be disgraced if you don’t put down 10%, 6% will suffice in Norway, and for the generous folk of Iceland, a tip is not necessary at all. In fact, in many locations worldwide, incorrect tipping is a topic that leads to great tension and offence. Thankfully Tipping Bird is here to guide you on what percentage of the bill is the right amount to put down. One small piece of advice – check your bill to see if a gratuity is already included in the expected payment. Overpaying can be just as offensive in some cultures as underpaying. As well as sparing you red-cheeks-aplenty in restaurant situations, this app also handily covers the etiquette of taxis, bars, hotel maids and porters, and even organised tours. Most reviews give it a full five stars, stating that it has accurate and up-to-date information that is helpful in an array of locations and situations. Some users, however, have reported that it’s a little buggy, and it doesn’t include every country on the map so make sure it’s relevant to your travels before installing. This entry was posted in Travel Advice, travel apps on March 27, 2014 by worldwideinsure.